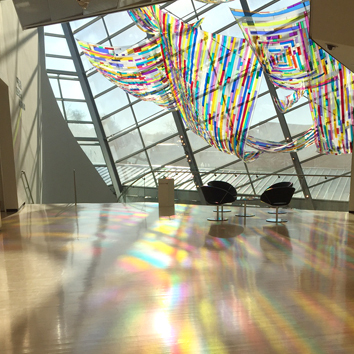 The Taubman Museum of Art is pleased to present a major site-specific fabric installation by nationally recognized artist Rachel B. Hayes that merges the artist’s fascination with notions of fragility and power, painting and quilt making, and the interplay of light and shadow. 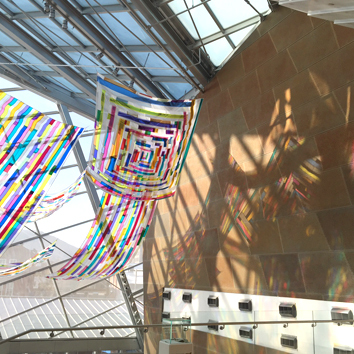 Inspired by the architecture of the Taubman’s three-story atrium designed by Randall Stout, Hayes created a suspended fabric sculpture exclusively out of multi-colored nylon, light gels and thread. Hayes’ Not Fade Away occupies an ambitious footprint extending 80 feet from the ground level and acts as a canopy over the 1,000-square-foot atrium floor. 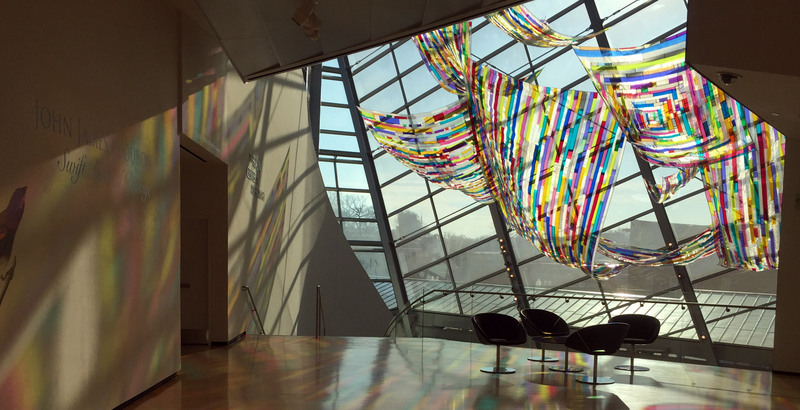 Appearing as a massively layered stained glass patchwork quilt, Hayes’ fiber-based sculpture bathes the space in vibrant, changing color as natural light enters the stunning glass façade of the atrium. In Not Fade Away, Hayes uses her fascination with processes and materials based in craft and design to create an abstract composition that embraces the language of painting while interacting with space in a sculptural manner. 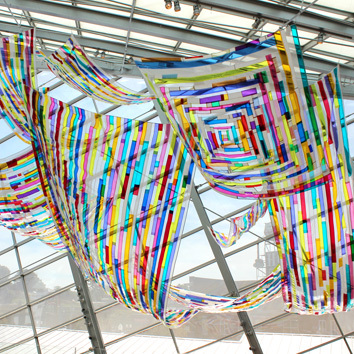 Her interaction with the Taubman’s atrium combines her dual approach to creating: a love of sewing referencing handmade quilts matched with her interest in highly architectural aesthetic sites. 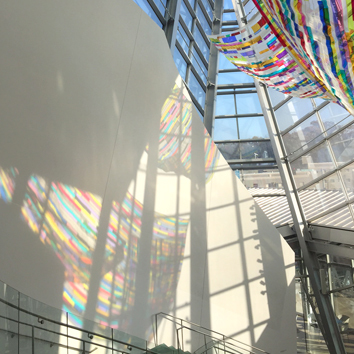 The natural and constantly shifting light that enters through the atrium windows filters through the piece, illuminating it like a jewel while colored light washes over the cloth, the atrium walls and the viewers below. Hayes’ site-specific installation continues an experimental atrium program established by the Museum in 2010. This program invites artists to create new work that stretches the limits of their production while offering them compelling opportunities to explore fresh ideas in their work. Rachel B. Hayes’ Not Fade Away is one of her most ambitious projects to date, with the Museum’s atrium providing both aesthetic opportunities as well as inherent challenges with its architecture. Hayes transformation of the Museum’s atrium with her patchwork site-specific construction provides visitors with new perspectives through her unusual grouping of materials as well as the setting it illuminates. Rachel Hayes received her Bachelor of Fine Arts from the Kansas City Art Institute in Fiber and went on to earn a Master of Fine Arts in Painting from Virginia Commonwealth University in Richmond, Virginia. She has attended the Marie Walsh Sharpe Space Program in Brooklyn, New York; the Sculpture Space Residency in Utica, New York; and the Art Omi International Artists' Residency in Omi, New York. Hayes is the recipient of the Augustus Saint-Gaudens Memorial Fellowship in Sculpture, a Virginia Museum of Fine Arts Professional Fellowship in Sculpture, and a Charlotte Street Fund Award. She has shown her work at the Sculpture Center in New York; Nerman Museum of Contemporary Art, Kansas; Roswell Museum of Art, New Mexico; Indianapolis Museum of Art, Indiana; Saint-Gaudens National Historic Site, New Hampshire; and in Lower Manhattan, New York City, with BravinLee Programs. Hayes has completed large outdoor commissions for the Rosslyn Business Improvement District in Rosslyn, Virginia, near Washington D.C., and for Artsbeat in Columbus, Georgia. She is also the recipient of a coveted Roswell Artist in Residence program in Roswell, New Mexico. Rachel B. Hayes: Not Fade Away is curated by Amy G. Moorefield, Deputy Director of Exhibitions and Collections at the Taubman Museum of Art, and is on view in the City of Roanoke Atrium September 25, 2015, through early June 2016. Exhibition sponsorship for Rachel B. Hayes: Not Fade Away has been provided in part by Sunbelt Rentals.